The early days of electric power in Detroit saw the launch of startup companies and created a ruckus not unlike events of the digital age. Charles F. Brush struggled to establish his credibility in the 1870s. The University of Michigan engineering graduate had gone back home to Cleveland to perfect his electric arc light and power generator, but he chose the wrong moment to reveal the invention, flipping the switch one evening as a parade passed his laboratory. Instead of receiving praise, he got scolded by a policeman. Wanamaker’s department store and Coney Island in New York City used Brush’s lights. Traveling shows also used his 16-light system, and people thronged to evening performances of the circus. In Detroit, an electric lamp blazed outside the old Free Press Building in the fall of 1879, and at the former Detroit Opera House in Campus Martius the following spring. The 1880s abounded in technological advances and startup companies. When railroads opened new lands to agriculture and commerce, people began talking about it on telephones. Electric power found capital-intensive applications in electrified street railways. 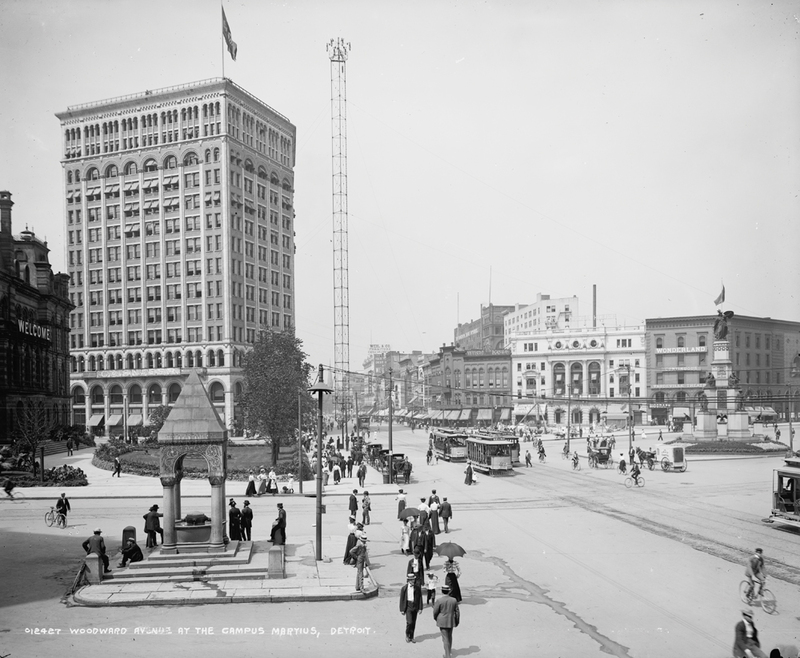 Electric elevators were a feature of Detroit’s first skyscraper, the 10-story Hammond Building, which opened in 1889 (using Edison incandescent lights) in the financial district. Another Clevelander, Wells W. Leggett, came to Detroit and partnered with two other investors in Brush Electric Lighting Co. After installing a generator in the Free Press Building’s basement in 1880, Brush Electric supplied lights for Woodward Avenue businesses. Within three years the company established a larger generating plant on Third Avenue between Fort and Congress streets. Customers found it worthwhile to pay $16 to $18 monthly per light. Street lighting was an obvious market, too, so the company erected a tower in Cass Park to show the strength of arc lamps as compared to the existing gas and naphtha ones. Gas suppliers and their lamp-lighting employees resisted the advance, but in 1884 the city experimented with 24 arc lamps. Before long, by contract, Brush Electric put up dozens of iron skeleton towers standing as tall as 160 feet, each one casting several powerful beams. Brush charged as much as $240 yearly per lamp. By the end of the decade, the city was being soaked for $138,000 per year. The new Detroit Electric Light & Power Co. also vied for lighting contracts, but after his election in 1889, Mayor Hazen S. Pingree pushed through public ownership of utilities. The city built its own light plant, and Edison Illuminating Co., progenitor of today’s DTE Energy, provided power at more reasonable rates. Streetlights were on lamp poles, so the skeleton towers came down. Leggett’s house and the Hammond Building were demolished in the 1950s, the original street rail service ended around the same time, and today the public spaces reveal few traces of that early period of technological innovation and upheaval.